The Annual Miss Native American USA (MNAUSA) Pageant is held in Arizona to crown a bright young woman to represent her tribe and platform on a national level. The young woman crowned becomes a goodwill ambassador. As stated on the MNAUSA site, the purpose of this important role is to help promote, support, and collaborate, in continuing education for Native communities, domestic violence, alcohol & drugs, suicide prevention, and many other areas, in both urban areas and reservations. Let’s meet the new MNAUSA, Autumn Rose Miskweminanocsqua William, from Shinnecock Indian Reservation located on Long Island, New York. Williams’ holds a Bachelors of Science in Mass Communications from Virginia Commonwealth University. Her platform is Indigenous Women’s Empowerment. Williams’ focus is on identity, connection to our culture, and the ability to balance tribal societal values with American societal norms. Together, we can help Williams promote her platform to the greater public by engaging in healthy dialogue surrounding issues that impact women. You can become an advocate for other women and support organizations that are important to you. Parents can promote fairness and inclusion to their daughters and sons to make a difference for future generations. Last, encourage women of all colors to achieve goals related to sustainability and development, leadership skills and self-esteem. It’s challenging to think forward about our future self but setting clear achievable goals can help provide great incentives and direction. Miss Native American USA, Autumn Rose Miskweminanocsqua William, is a positive example for young women. The Office of Equity, Diversity and Inclusion looks forward to supporting and learning more about the Women’s Empowerment platform and future projects. 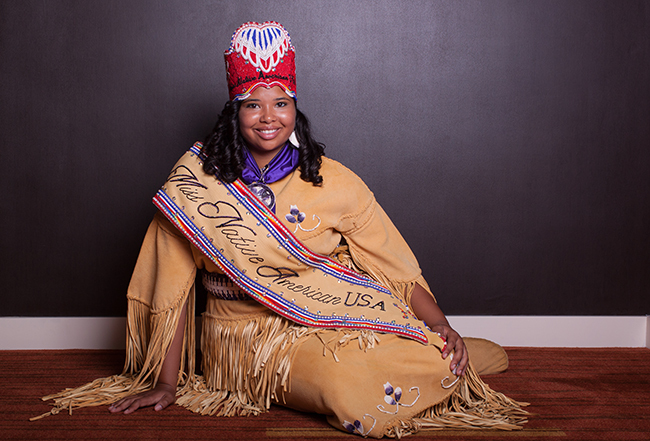 To learn more about Miss Native America USA, please visit www.missnativeamericanusa.com.